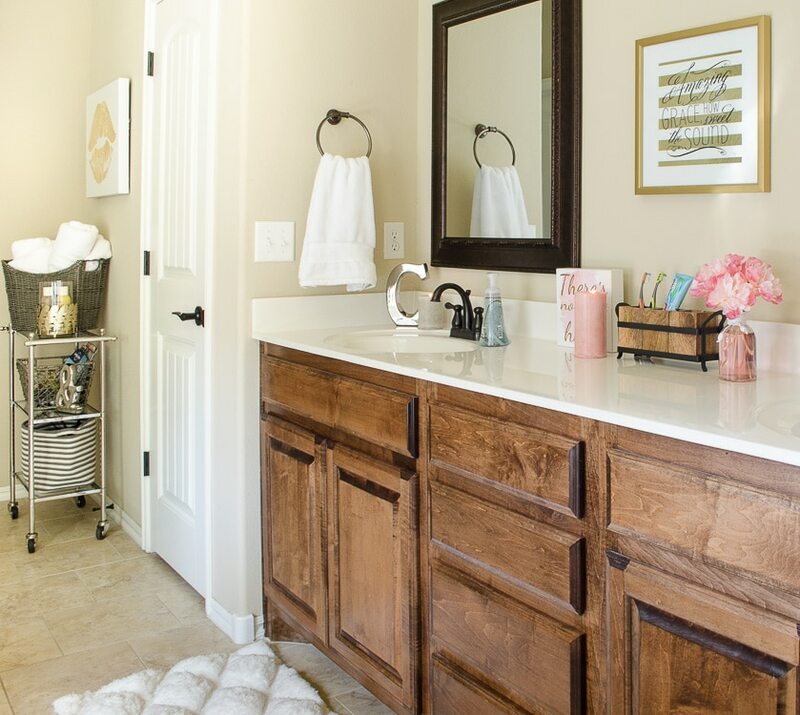 Our bathroom vanity top is one of the biggest problem areas we have when it comes to clutter and cleanliness. Usually because once the clutter starts, it’s harder to clean and the snowball effect happens FAST. When Lana pitched the idea of sharing her sink area strategy as her first post, I had tunnel vision and couldn’t even tell you what her other ideas where. I knew I NEEDED this one for us, which usually means there is a good chance you have the same struggle. I can tell you I quickly implemented her first tip, and in the week I’ve had her draft, it’s already made a huge difference! 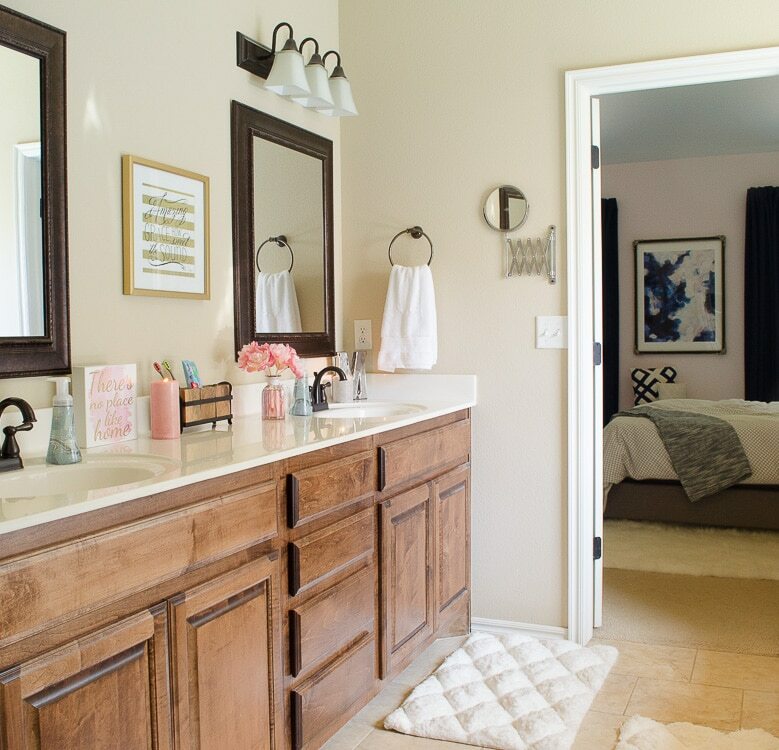 Is your bathroom sink as clean as you’d like? Would you eat soup out of it? Keeping your sink spotless can be tricky. I mean, it’s painstakingly visible and there’s no lid, so you can’t cover it. Honestly, bathrooms aren’t my first priority and there’s no shame in that. However, I still crave a dreamy and glistening white sink with a few well-placed items in the corners. It’s time to face it…that geometric shower curtain should not bear the burden of styling your bathroom. Stay with me, because I am offering you a strategy, not a “to-do” list. So countdown with me and find out how to maintain your dazzlingly white sink with three easy habits. My youngest son sings his ABC’s twice while he washes his hands, because he heard that’s the amount of time needed. I say, why not spread the love while you wash? I’ve already got the soap, and my hands are already dirty, so I rub them around the sink generously and get anything off that’s leftover or snuck in during the night watches. I may not do it every time, but it’s a good tool for the tool belt because it doesn’t take any extra time. What will you do with this stolen time? Create a secret spot under your sink where you store a treat, like an individually wrapped Ghiradelli’s dark chocolate square. What if you knew you were entitled to that every time you cleaned the sink? One relaxing morning I strolled into the bathroom to find toothpaste roads and a spit landscape in the sink bowl. Seriously, that’s gross! That pasty, light blue streak was keeping me from my morning routine. I don’t know about you, but I do not want to clean my bathroom in the morning. I have a hard enough time deciding to get ready in the first place! So I found my inner royalty and proclaimed my first royal decree: From this point hence, I hereby decree that communal tooth brushing must be the only kind of evening tooth brushing. I’ve found that the simplicity of creating this simultaneous act of communal brushing means I only have to use one Clorox wipe…genius! So imagine you’re the Queen and create your own proclamation! What is it that fits into your life? Maybe it’s the “last one out” or the “whoever is oldest” is in charge of a quick daily Clorox sink scrub. We aren’t slaves to the rules, they are slaves to us! You may be busy, but I know you have two seconds. When you, your kids, or your man leave something on the sink that you don’t like, put it back with a smile! It’s like the endless toilet seat argument. Who’s responsibility is it? Well, I don’t want to step on any toes, but I do want to save you counseling money. The answer is this: whoever cares most should do it. If you can find it in your stylish heart to put away these items, or wipe up those tiny hairs from shaving, you’ll be rewarded with that shiny porcelain glow. Now you’re ready. 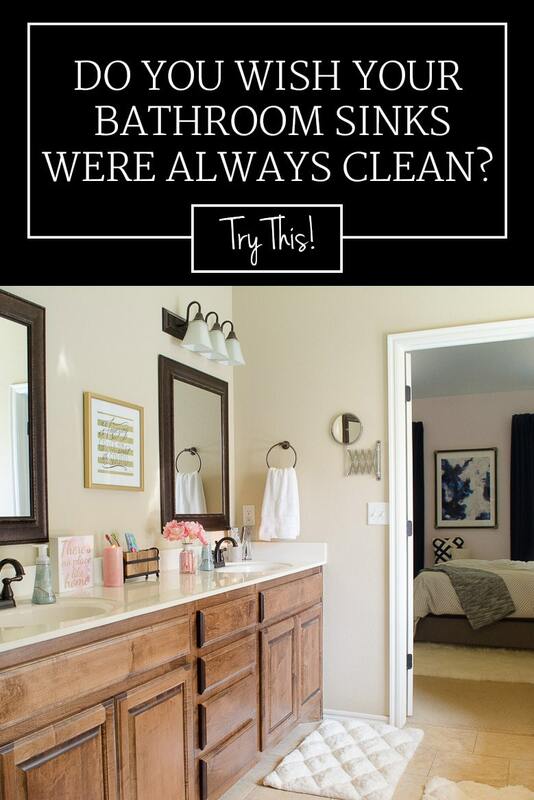 Ladle that soup into your sink and enjoy the drastic change that a clean sink can bring to a bathroom. Now, if I could just get to my bathroom floors…stay tuned! Great advice from Lana, right? Anyone that suggests I get a chocolate reward for cleaning is a winner in my book! 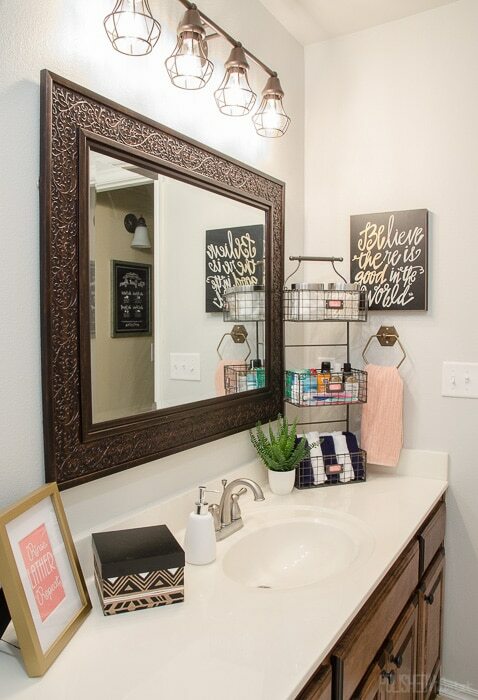 Where did you get the container in your bathroom for the toothbrushes & toothpaste there in the middle? I LOVE it!